Mr. Denis Weis, the owner of 'Le Chemin de Ronde', believes in an ecological approach where his garden is concerned. 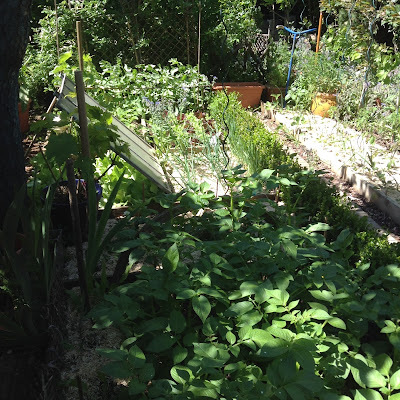 He has between 400-500 plants in a relatively small garden. 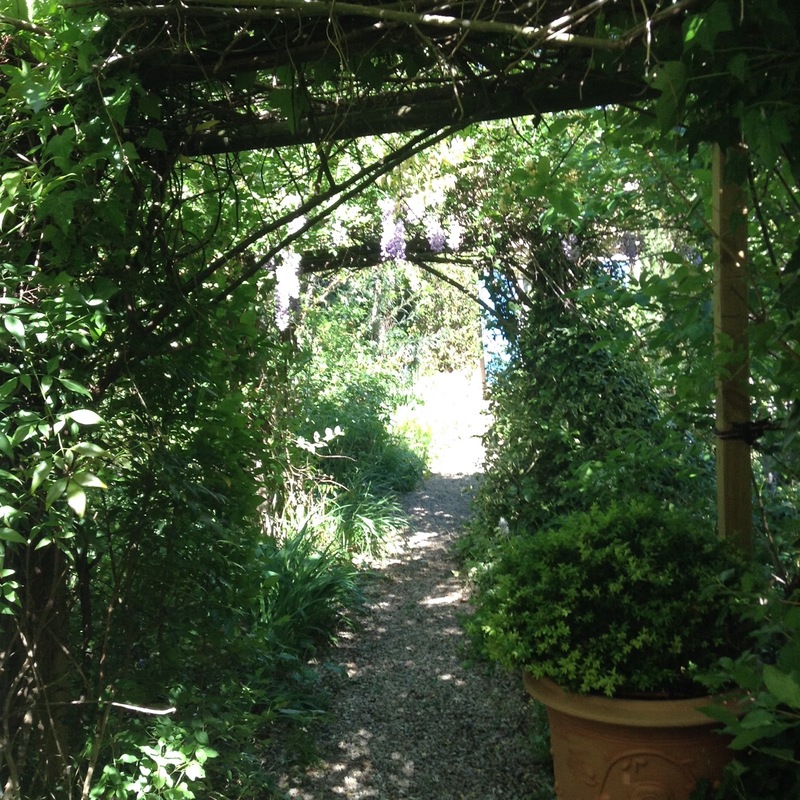 A path in a circle runs along the garden with different aspects as you go along. 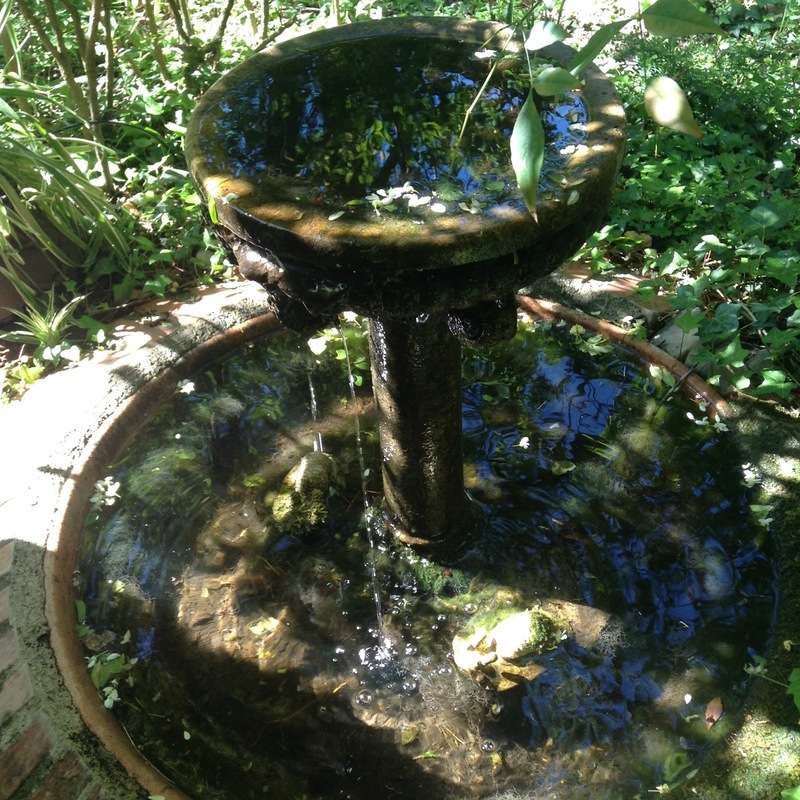 M. Weiss had created a lily pond with fish leading into a small stream with a little bridge over, which in turn flowed into a smaller pond with a fountain. The garden was divided up into "'regions" and thus appeared much larger than it was. He explained, when I asked him if there were any frogs, that they do not croak when it's windy! A variegated Artemisia, I was giving a piece when we last visited the garden, very invasive! He suggested that you should have here and there gaps in the lay out of the garden that lead the eye towards a distant statue or decorative plant/pot. Makes the garden look larger. 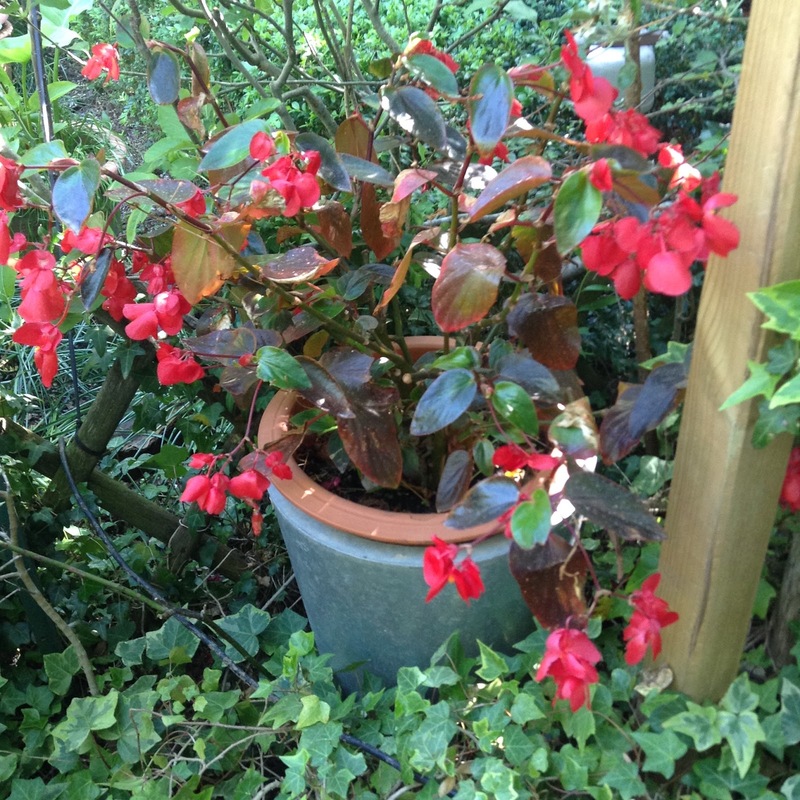 Mix evergeen and deciduous shrub so that you have always some colour in the garden, even in winter. He has also constructed small ponds at several places in the garden with the help of agricultural plastic with the purpose of trapping insects. He used to have an automatic watering system but he disconnected it as he found that different plants have different requirements so he now does it by hand. 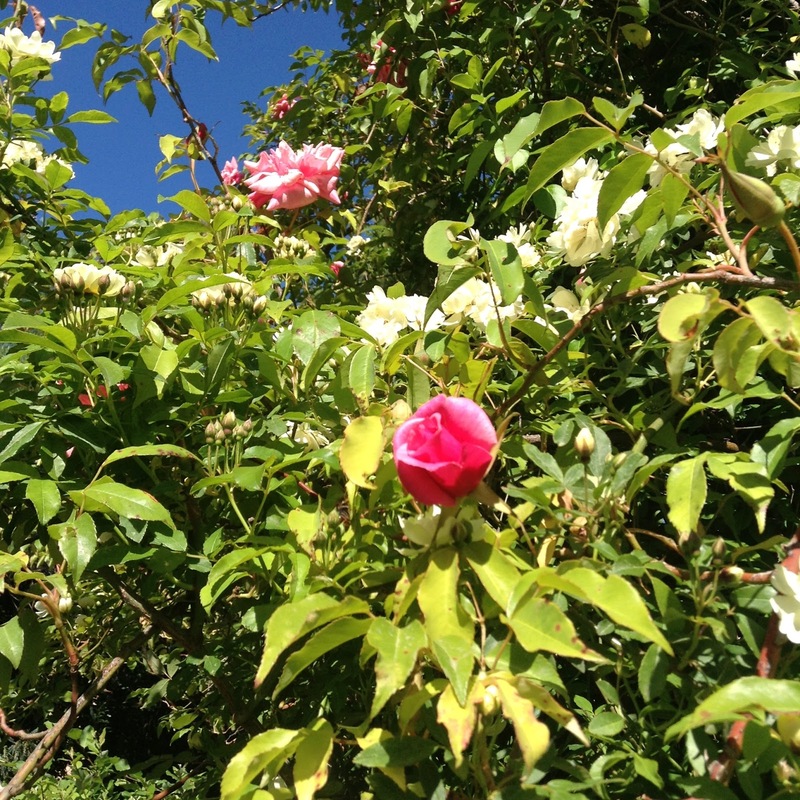 If you have an exposed garden, as a windbreak, use a mixed hedge. 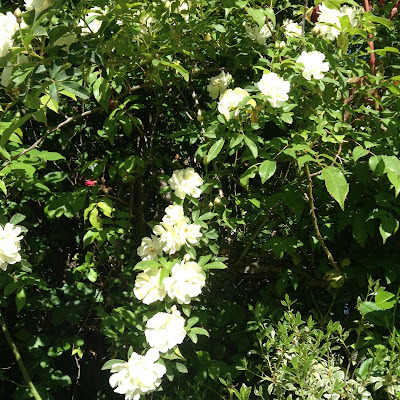 Some of the shrubs that he recommended to use in a mixed hedge were, white and pink flowering Hawthorn (Crataegus); entwined with different rambling roses, for example Rosa 'Kiftgate', Rosa banksiae; Pittosporum; Cornus alba. Using as a windbreak an impregnable, thick hedge made up of conifers has the effect of the wind going over the hedge and down into the garden, in fact it does not serve as a windbreak at all. 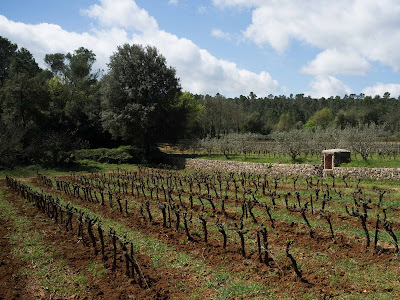 He mentioned that Horse Manure (Fumier de Cheval), using his expression, is a 'hot manure' to be used in spring, whilst Sheep Manure (Fumier de Mouton) being a 'cold manure' should be used in autumn. 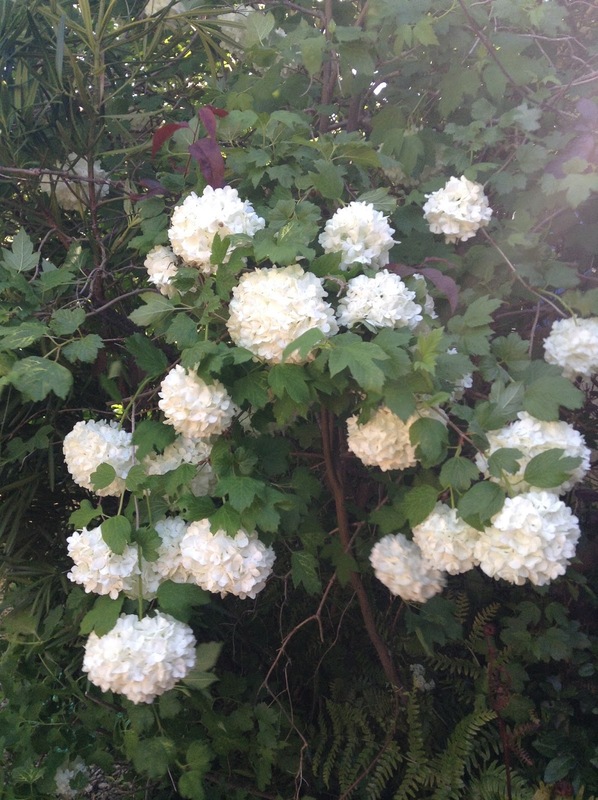 To prevent and treat plant illnesses he uses 'Bouille Bordelaise', the clear powdered one. When you dig up your Irises after they've become too dense and have stopped flowering, do not put them back in the same spot straight away. 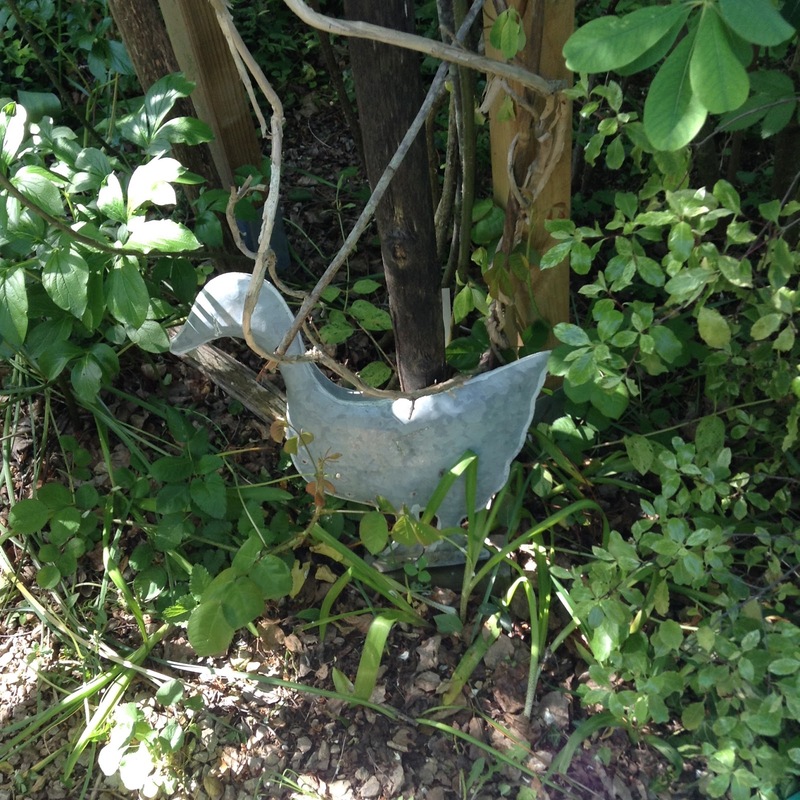 Wait a year before you replant them after have fertilised the soil. 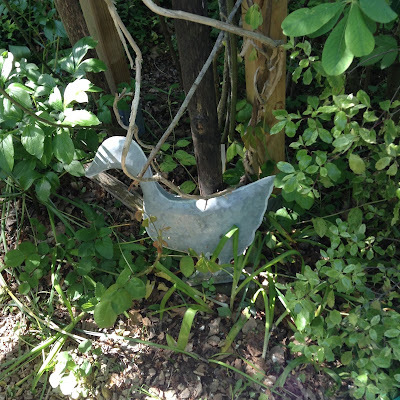 If you use your own compost, make sure it is well rotted. To control mosquitoes he has a machine that works over a distance of 1000-2500 m2. The machine in itself costs about 500€ and uses cartridges which cost 40€ for 3, but works very well! It had a small pump and the cartouche attached to the base was suffused with human aromas (he didn't go into details!) that attracted the female moustiques which entered and then got trapped in a filter, at the top. Each cartridge lasts one month. He also relied on the frogs and small fish, pond life etc. to eat the larvae of the insects! Wood shavings around the vegetable plants thwarted the slugs and also made good mulch when broken down at the end of the season. This can be bought in bags. 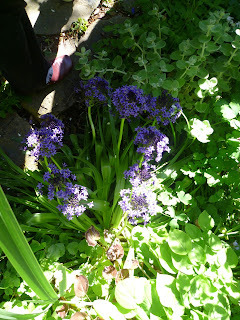 He showed us a multitude of bio products which he puts around his plants for nourishing and improving the soil. Savon noir made a good black/ green fly killer. To treat the Box moth he uses a product called 'Bacillus Thuringiensis' which you can buy from the Co-op. 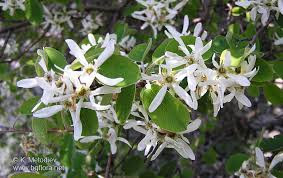 He suggests to use variegated syringa, it looks much more delicate and attractive than the common bush. He had some large and dwarf bamboo, but it must have been kept in check by some sort of barrier. 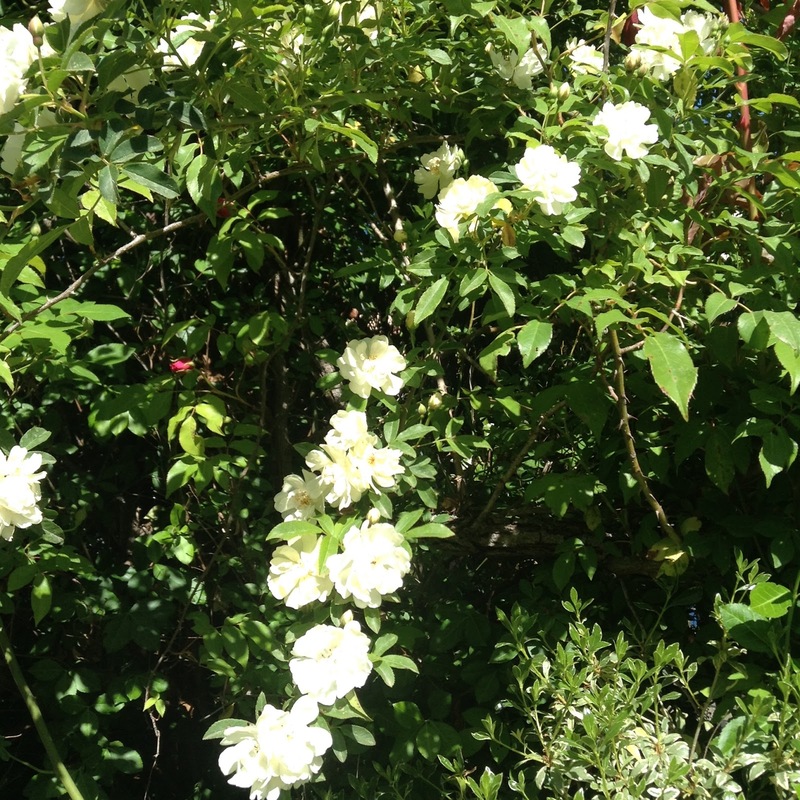 He had various types of roses including a pale lemon banksiae. A pale pink euphorbia (crown of thorns) was growing in a pot. A lot of his plants were growing in pots, so that, I assume, he could bring them indoors if the weather turned frosty. He had a lawn but not of grass......it was made up of daisies and other small flowering wild plants for the bees and other insects. Photos: Jacqueline Hodkinson, Ellie Bos, Liz & John. Info contributed by: Diana Hart, Jacqueline Hodkinson, Rini Rubbens and Sue Spence. In the summer of 2015 we were approached by the Mediterranean Garden Society of the Var with the suggestion to have more contact between our two groups and where possible organise something together. As both our groups are quite large a joint garden visit was ruled out because of the numbers. We then suggested we would organise a joint walk in spring and have lunch together. 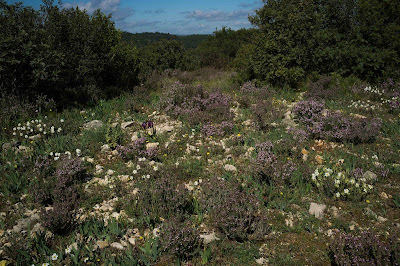 As I am quite familiar with the platelau above Correns and know that in spring it is a lovely place for a walk, I suggested Correns as the venue. 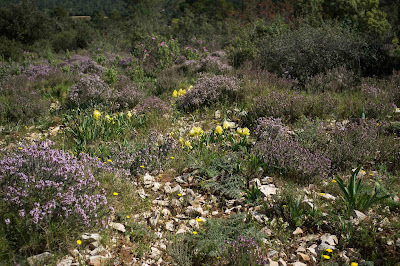 We were lucky, the irises, Iris lutescens, although almost over, tulips, Tulipa australis, Viburnum tuberosa and masses of thyme, Thymus vulgaris, were all flowering at the same time. 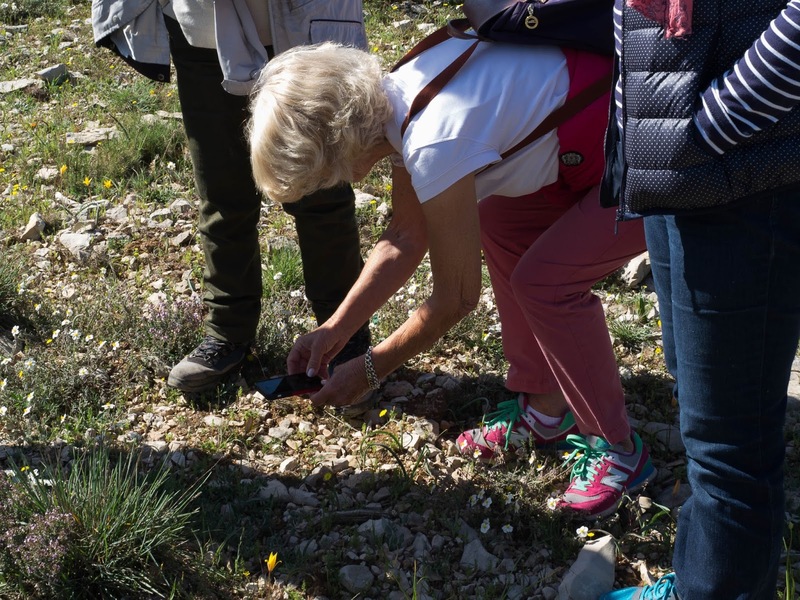 As we got out of the car we saw our first plant, Coronilla juncea, so called because of its branches, they stay green, with few leaves, similar to a rush, Juncea. The flowers are in the form of a crown just like Coronilla valentina. 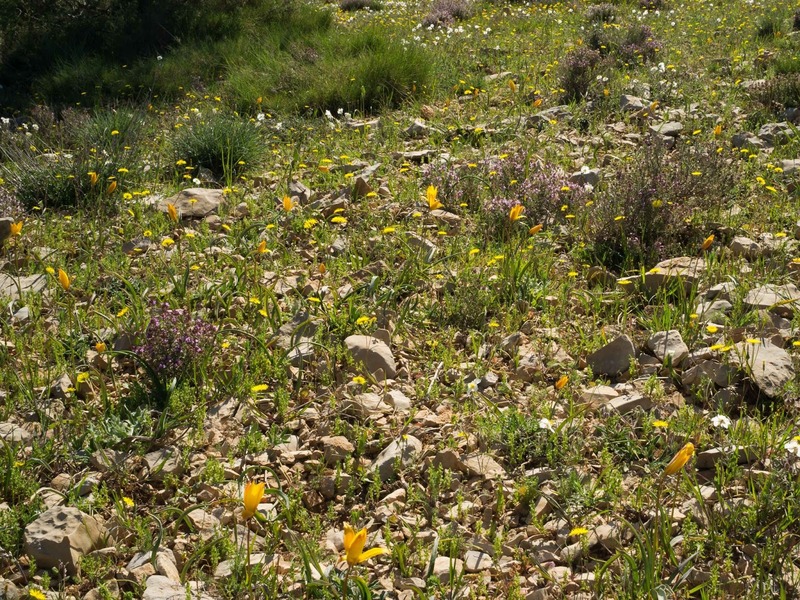 There are two Cistus' growing on the plateau, Cistus albidus and Cistus salvifolius. 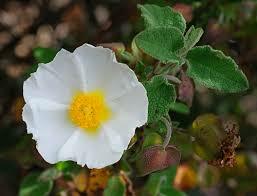 Cistus albidus was flowering in abundance. 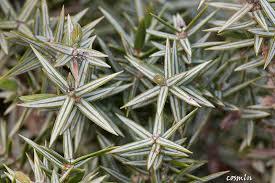 The name 'albidus', meaning white refers to the dense white hairs on the leaves giving them a grey appearance. 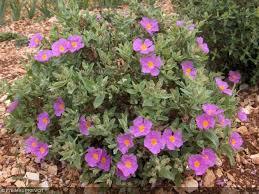 Cistus salvifolius has mid-green leaves, a bit crinkly, similar to sage leaves. Flowers are white with a splash of yellow at the bottom of each petal. Rosemary, Rosmarinus officinalis, the leaves are used in cooking, goes very well with lamb. It has a dual purpose, it gives off a nice flavour to dishes and it aids the digestion. A tisane of rosemary leaves after dinner is similarly useful. They took an ember from the fire and put the above mixture on the ember. Inhale as long as possible the fumes. Nowadays we would use a diffuser to inhale our selection of essential oils. Don't use rosemary essential oil before going to sleep. It stimulates. Inhaling a few drops of rosemary essential oil on a hankie, on a long car journey when you feel your concentration slipping, keeps you alert. Phillyrea latifolia and Phillyrea angustifolia, 'latifolia' meaning broad leaves and angustifolia, meaning narrow leaved. 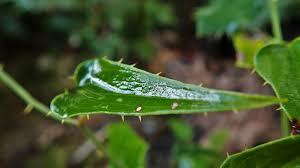 An old Provencal custom to treat a headache was make a poultice of the chopped leaves, lie down and place it on the forehead. Phillyreas can be used as a Box substitute. Kermes oak, Quercus coccifera, with shiny, very prickly small leaves, more a shrub than a tree, the acorn cup is covered in prickly scales. Holm Oak, Quercus ilex, green, shiny above, whitish underneath. Downy Oak, Quercus pubescent, looses its leaves. Cork oak, Quercus suber, not in our area but on acid soil. A red dye is produced from a worm called 'Coccus ilicis' that seeks out the Kermes oak to lay its eggs. This worm climbs into the tree gives birth to eggs, while giving birth, she expels a red fluid covering herself and the eggs. After giving birth she dies, for a period of 3 days the worm can be scraped of the tree and used as a dye. 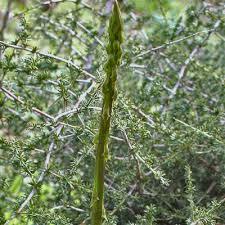 An important culinary herb, one of the herbs used in 'bouquet garni'. 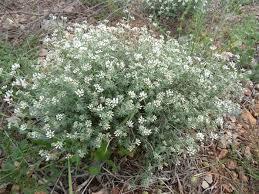 Thyme must is the most useful herb in our area. 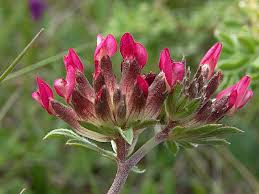 Strongly antiseptic, antibacterial, aids digestion, stimulating effect on nervous system, relaxes spasms. The essential oil of Thyme has different usages depending on where it grows. The environment, climate and soil produces different chemotypes ( different chemical structures). To give an example, Thymus vulgaris 'thymol' has strong antiseptic properties whilst Thymus vulgaris 'linalool' is the most gentle of all thyme chemotypes and has anti parasitic and anti fungal properties. There are in total 9 different chemotypes in Thymus vulgaris. Recent suggestions have been to use it against Staphylococcus species including MRSA ( meticillin resistant Staphylococcus aureus - super bug). Greek wine 'Retsina' is flavoured with the resin of the Aleppo pine. The wood is hard, dense and pliable.The resin is distilled to produce turpentine. 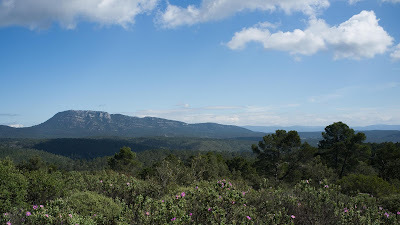 There are two Junipers growing on the plateau, Juniperis communis and Juniperus oxycedrus. It has just 1 central strip on each leaves. The berries are used to flavour meats, gin, sauerkraut, vegetables and liqueurs. 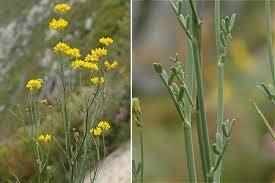 Medicinally used as an antiseptic for urinal tract infections, to increase gastric secretions and to improve appetite. The leaves are needle-like with 2 white stripes, in whorls of 3, spine-tipped. The wood, rich in "oleoresin" provides cade oil through a process of dry distillation. The oil has locally been used for all sorts of skin problems, eczema, psoriasis, extreme itchy skin (prurigo) and scabies. It is used in cosmetics for men like shaving cream and after-shave lotions. 1. 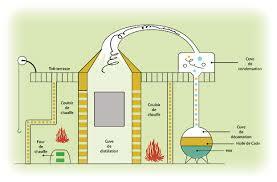 The two ovens are heated, the intense heat penetrates through the double wall into the distillation vessel. 2. The pieces of wood stacked in the distillation vessel turn into charcoal. At the same time the gases inside the wood are released and pass upwards through a conduit. 3. The conduit passes through a cold water bath to cool the gases which become liquid (condensation principle). 4. This liquid drains into a settling tank. The water contained in the wood and the black cade oil are separated by their difference in density. In the same family as Pistachio Vera ( Pistachio nut tree) and Pistachio terebinthus ( Turpentine tree). 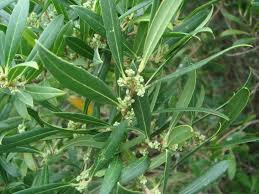 Pistachio lentiscus is an evergreen, very decorative as a garden plant, has pinnate leaves, with no end leaflet. 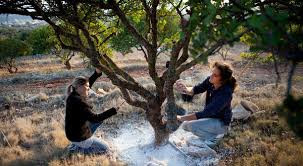 On the Greek island of Chios, the mastic tree is cultivated since the 14th century because of its resin (gum mastic). Incisions are made into the trunk and thick branches. During the Ottoman period it was very popular especially by the ladies of the harem. It was one of the earliest chewing gums, by chewing it cleanses the mouth and teeth, strengthens the gums. It was one of the ingredient in Turkish delight, the chewines came from the mastic gum, it has now been replaced by corn flour. 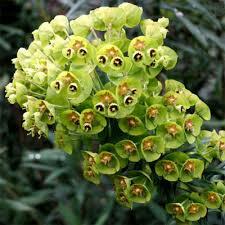 The resin is used to treat peptic ulcers and an effective treatment for the Helicobacter pylori bacteria. Deciduous, pinnate, 3-9 leaflets with an end leaflet. It is considered to be the earliest source of turpentine. Almost finished flowering. The flower stalk is densely packed with blue-black, urn-shaped flowers. A ring of white teeth surround the entry into each flower. The bulbs are eaten in Greece and Italy. Quite similar to the Phillyria species. 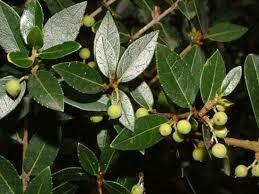 To tell the difference, Rhamnus leaves are alternated on the branches, Phillyria has opposite leaves. Ancient Britons crushed the leaves to make a paste and paint their bodies with it. Painting their bodies blue had a dual purpose, frightening their adversaries, it stops bleeding and assists in the healing of wounds and ulcers, useful when you've been in a battle. It was a popular fabric dye. Toulouse became prosperous through the woad trade. 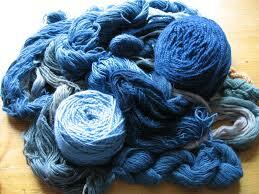 Woad was superseded by Indigo and both were superseded by synthetic dyes in the 20th century. Also known as Iris chamaeiris (more appropriate really as chamaeiris means 'small' and lutescens means 'yellow', this Iris comes in various colours. Same family as Valerian (Centrantus ruber), Valerianaceae family. 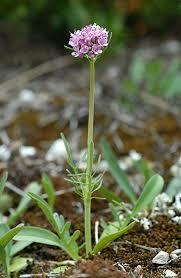 It has similar flowers to Valerian but no spur and the flower tube is shorter, in addition it has tuberous roots. Basal leaves spoon-shaped, stem leaves pinnate. Fragrant. 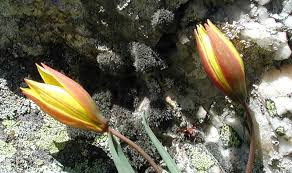 Before flowering, during the winter, used as a sald leaf. Leaves are edible in small quantities. 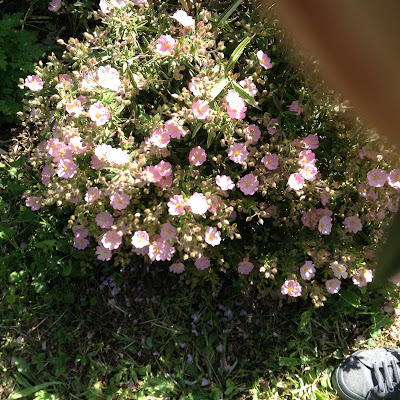 They are fleshy, pointed, grey-green, dense, flat on one side..Flowers pale yellow/green borne in a dense inflorescence on branches curving backwards, in fruit they curve inwards. Common stork's Bill, annual, hairy, variable. 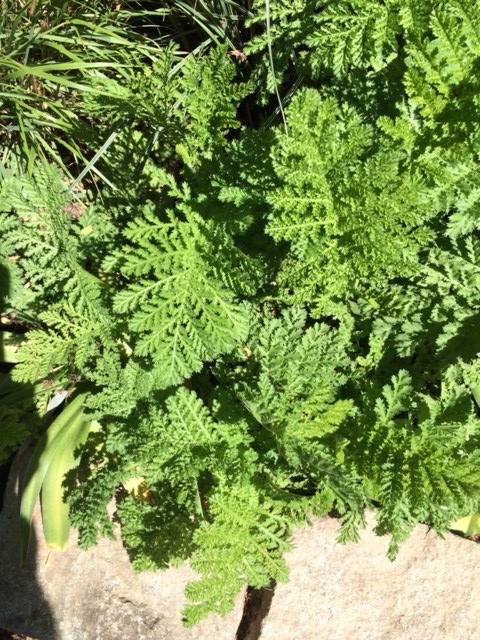 Leaves are pinnate and toothed. Fruit with beak, 1-4 cm long. Two upper petals often larger with a dark basal blotch. Quite common. Very common in the area. Cup-like structure of a Euphorbia is called a cyathium, it is unique, no other plant is quite like it, it has fused bracts, often very colourful, the first thing you notice when you look at the plant; small male flowers, hardly noticeable; nectar glands (colourful) which vary in colour from deep red to shades of brown, they are their to attract the insects; and right in the middle the female part with the ovary on a stalk. So called as the leaves smell of curry, they can be added to dishes as a flavouring agent, the leaves do not taste of curry, more like sage. Needs to be removed before eating. From the blossom an essential oil is producedl, which is anti-inflammoratory, fungicidal and astringent, soothes burns and raw chapped skin. Occitane uses Helichrysum iitalicum essential oil in their skin products. One of their products 'Divine', states that the cream protects the skin from aging. 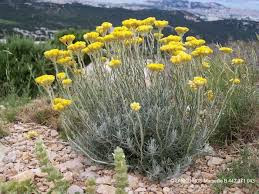 The essential oil of Helichrysum italicum contains antioxidant properties. Antioxidants control and eliminate free radicals, this has a positive effect on the skin. They claim, it slows down aging, stimulates collagen production, thus improving skin firmness. Our skin has a protective barrier called the epidermal barrier, essential oil can penetrate this barrier because of their small molecular structure and weight. Occitan has done tests and have discovered that within 20 minutes after the essential oil in the cream has penetrated the cell membrane it has entered the bloodstream. Worse than bind weed, it climbs or scrambles over trees and shrubs just like bindweed but on top of it, it has thorny branches. It does have its good uses, local people used the root to treat rheumatism and skin disorders. Buxus wood is very hard and is used in printing blocks, tool handles and mallet heads. Leaves, bark and wood, lowers fever and destroys intestinal parasites. Grown in gardens since medieval times for hedging and topiary. A rather attractive plant, grey-leaved that forms a neat shape. Leaves are linear-oblong, in whorls of five. Tiny white flowers in terminal umbels 5-20. 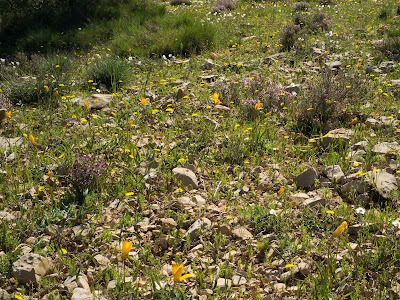 Helianthemum canum, with small yellow flowers and Helianthemum appeninum, grey in appearance with large white flowers. 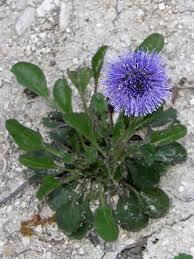 A tufted hairless perennial with numerous rush-like , tough slender bluish-grey stems. 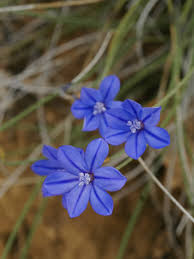 Sky-blue flowers with 5 tepals, each with a dark mid-vein. The tepals have overlapping papery bracts at the base. Flowers are packed in dense, rounded, blue head, with a darker circle of flowers in the middle. Flower head is surrounded by a frilled collar of bracts. Leaves produce a yellow dye. Tubular flowers with dark brown or dark purple flap. They give off an unpleasant odour. 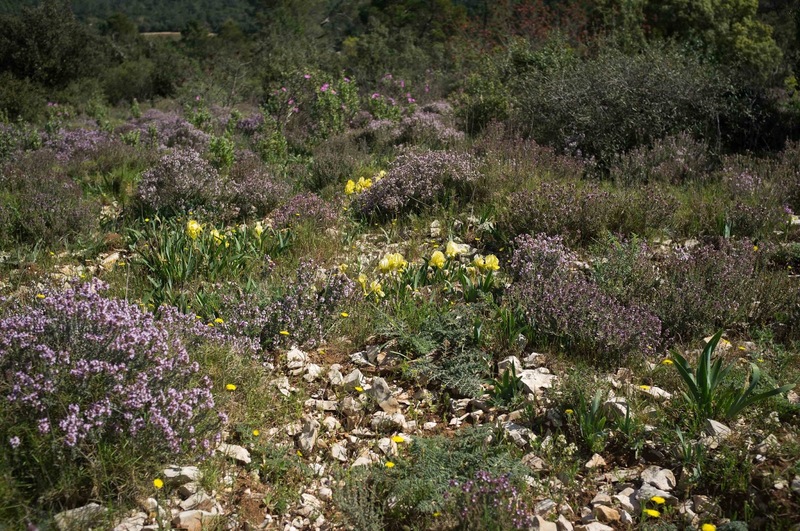 The flowers were used in Provence to make a pleasant herbal tea that helps the digestion. Leaves hairy, pinnate, 9-15 pairs. 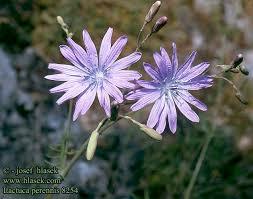 Flower heads are long-stalked in various colours depending on soil and region. 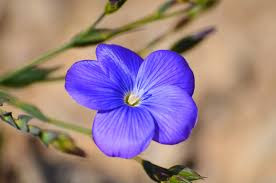 Related to the cultivated Linum usitatissimum with its dietary fibres, its Omega 3 fatty acids, its anti-oxidant properties and not to forget linseed oi, used as a mild laxative. A local Acer with 3-lobed leaves, very colourful in autumn. 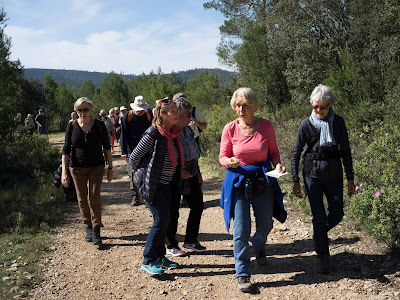 We are now entering the forest part of our walk and realised we were quite late for our next appointment, the restaurant 'La Terrasse' in Cotignac where we were meeting our members who were not able to come on the walk. Winter flowering. Very useful for the bees in winter. Heather honey, a brown honey, is one of the ingredients in 'Pain d'epices'. In former times it was used as a cure for kidney stones. Scientific evidence today shows it is astringent, works as a diuretic and antiseptic and useful in chronic urinary tract infections. What you think are leaves are in fact 'cladodes', needle like modified stems. Young shoots are collected in early spring and are considered a local delicacy. 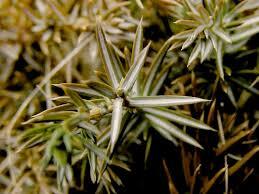 The shoots are rich in minerals and have diuretic properties. Sori in two rows on the underside of the leaves. Sori's are clusters of sporangia (structures producing spores) in ferns and fungi. Root: bittersweet in taste, used to be used as a spice in the manufacturing of nougat. 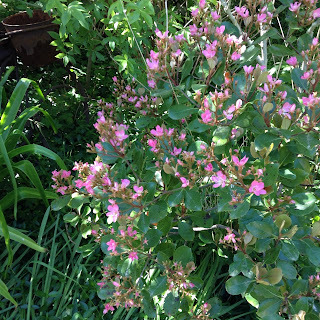 Leaves and flowers appear at the same time in spring. Star-shaped white flowers with numerous stamens. Fruits are edible raw or cooked, sweet and juicy, the dried fruit are similar to raisins. Rich in vitamin C and P (bioflavonoids), iron and copper. Beautiful autumn colours. There was a small tree growing on the plateau with bright green leaves. 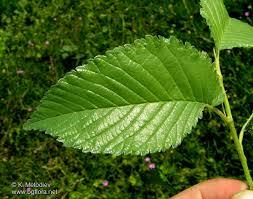 I was asked what type of tree it was, I did not know at the time, it is in fact an Ulmus minor. One way of recognising tree is by looking at the leaf, the part of the leaf near the stalk is asymmetrical. A special thank you to Isabel for trying out the walk with me several times and to Tineke for sending us photos of the plateau and our group. 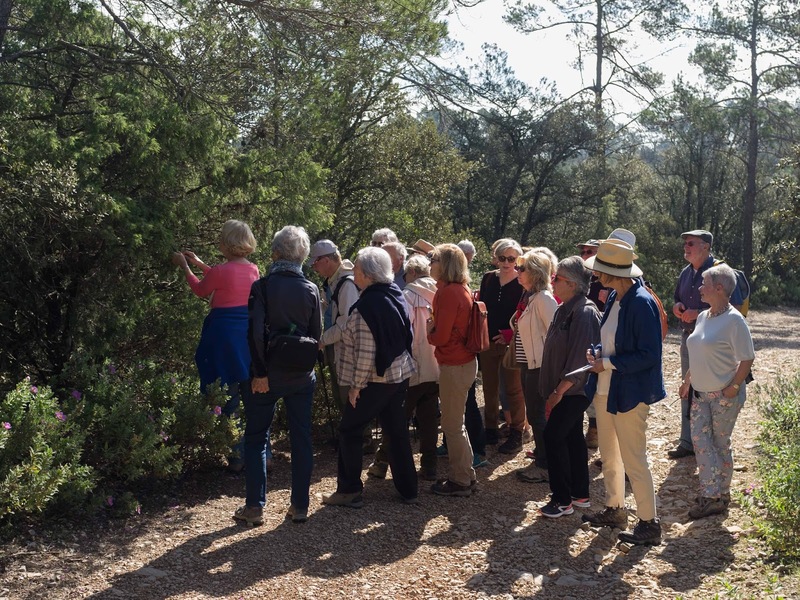 It was a very pleasant experience meeting up with the Mediterranean Garden Society and no doubt we will meet again in the future.